The trade deadline is heating up … well, the rumors are anyway. Manny Machado to the Yankees! Scooter Gennett to the Dodgers! J.T. Realmuto to the Red Sox! Maybe all these blockbusters will happen, and even if they don’t, hey, it’s fun to speculate. One thing seems clear about this deadline: It’s going to be weak in starting pitchers, so teams needing to plug a hole in their rotation might instead look to upgrade the bullpen or the offense. Contenders and also-rans have one thing in common: They need these stars, regulars or prospects to deliver big things. His Dark Knight days might be over, but the former Mets ace is throwing hard and getting swinging strikes in his reincarnation as a Red. For the Orioles, the answer is pretty simple. But for a number of other teams there’s a difficult decision to be made ahead of the trade deadline. Keep in mind, as well, how the deadline has changed in recent years. As Joe Sheehan pointed out, the teams making the biggest moves haven’t been those fighting to get into the playoffs, but those who have already locked down a playoff spot and are looking to improve their postseason roster — think Yu Darvish to the Dodgers and Justin Verlander to the Astros last year (although that was an August trade) or Aroldis Chapman to the Cubs and Andrew Miller to the Indians in 2016. Boston Red Sox — Tanner Houck, RHP. It has been a disastrous season for Boston’s top four prospects — Jay Groome had Tommy John surgery, Michael Chavis was suspended for PEDs and Houck and Bryan Mata can’t throw strikes — and since they’re not going to trade Rafael Devers for a couple of months of Manny Machado, they probably won’t do much more than add a bullpen arm. New York Yankees — Dillon Tate, RHP. While Gleyber Torres and Miguel Andujar have excelled at the major league level, many of the top prospects still in the minors have struggled with injuries and/or performance. Tate has been healthy and pitched well in Double-A and could help bring in a starter to add rotation depth. Now, Ken Rosenthal of The Athletic reported the Yankees are “showing increased interest” in Machado. That could be mean swapping Andujar. What do you think, Yankees fans? Tampa Bay Rays — Nathan Eovaldi, RHP. After missing all of 2017, Eovaldi has allowed one hit in two of his past three starts and had six no-hit innings in another. He has turned into a strike-throwing machine (44 strikeouts, six walks), and he’s an impending free agent. Given the lack of quality starters available, Eovaldi suddenly looks like a hot commodity. Toronto Blue Jays — J.A. Happ, LHP. Josh Donaldson‘s injuries have lowered his trade value, so the Blue Jays might keep him and give him a qualifying offer. Happ isn’t a difference-maker, and he has been hammered his past two starts, but somebody will trade for him. Baltimore Orioles — Manny Machado, SS/3B. The Orioles are looking for their version of the Torres-Chapman trade the Yankees made with the Cubs in 2016. They might not get that, but the Orioles should get a top prospect in return. Cleveland Indians — Francisco Mejia, C/OF. With Yan Gomes still under contract for up to three more seasons (with team options), Mejia’s path to being a starting catcher isn’t clear, especially given how much the Indians love Gomes’ defense. Mejia has bounced back in Triple-A from a terrible start, but the bat looks merely good more than special right now. The Indians haven’t won a World Series since 1948. Mejia for Machado? Minnesota Twins — Eduardo Escobar, 3B/SS. The Twins might be the most disappointing team of 2018, failing to take advantage of a weak division. They might just run the course and hope to get hot in the second half, but Escobar and Brian Dozier are both free agents and potential trade bait if Minnesota decides to sell. Detroit Tigers — Leonys Martin, CF. Martin is on the disabled list with a hamstring strain, but he’s a plus defender in center and was having a solid enough year at the plate (.257/.327/.431). He’s a potential fit for the Indians (28th in the majors in wOBA from their center fielders) or the Astros, who could use another left-handed bat if rookie Kyle Tucker isn’t ready. They could play Martin in center with Josh Reddick and George Springer in the corners. Chicago White Sox — Joakim Soria, RHP. The easiest thing for contenders to do is load up in the bullpen, and Soria is having another solid season. The best thing I see is the way he has limited home runs the past two seasons (just three in 89⅔ innings). 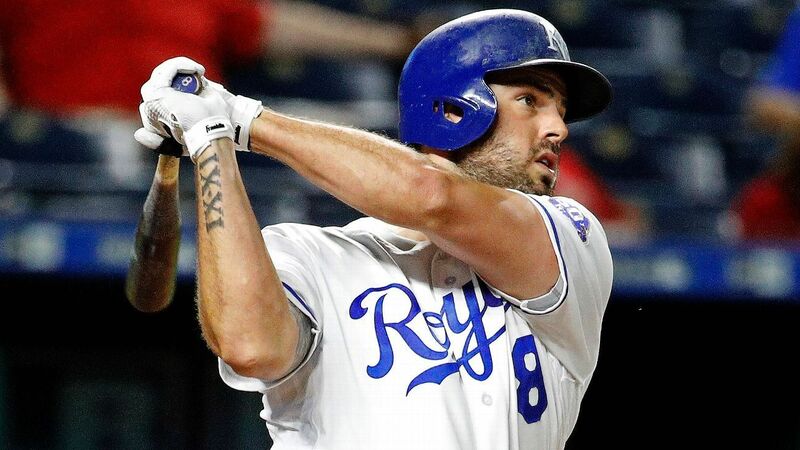 Kansas City Royals — Mike Moustakas, 3B. A cheaper alternative to Machado if you want a third baseman, although with a .309 OBP, he’s not really a major impact bat. One rumor had the Yankees interested in him as a first baseman with Greg Bird continuing to struggle. Houston Astros — Cionel Perez, LHP. Concerns about the Astros’ bullpen are overblown even if they don’t have an obvious lockdown closer, but maybe they’ll look to add another piece. They also could add an outfielder or a left-handed option at DH or first base. Perez is a small lefty with a 1.98 ERA and 83 strikeouts in 68⅓ innings at Double-A Corpus Christi, relying on a low-90s fastball with sink and a good slider. Seattle Mariners — Juan Querecuto, SS. The Mariners made an earlier trade for Alex Colome and they have the weakest farm system in the majors, so a major deal probably isn’t in the works. Querecuto was a top-30 international prospect when the Mariners signed him last year for $1.225 million, but he’s years from the majors — and thus definite Jerry Dipoto trade bait. Oakland Athletics — Franklin Barreto, 2B/SS. The A’s absolutely should be buyers and not sellers, given Seattle’s 6.5-game lead over them is based on the Mariners’ remarkable (and unsustainable?) record in extra innings and one-run games. In 2014, Barreto was the prime prospect acquired for Donaldson, but he has struggled in his big league trials with a .203 average and 56 strikeouts against six walks. He’s still young, and maybe another team will take a chance that he figures things out. Los Angeles Angels — Blake Parker, RHP. At this point, the Angels need a big run and the Mariners and A’s to fold have a chance at the wild card. Good luck with that. They’re kind of stuck in no man’s land, but they may as well flip Parker for some random kid in A-ball with some tools and potential. Texas Rangers — Cole Hamels, LHP. This is a tough one. Hamels can block a trade to 21 teams, including the Yankees (that doesn’t mean he would block a trade). Maybe he waives his no-trade clause if a team agrees to pick up his $20 million team option for 2019. He also has a 4.28 ERA and has allowed 21 home runs in 103 innings (although his strikeout rate has increased this season from 2017), so a team has to be careful it’s not trading for Hamels’ reputation as opposed to what he is right now. Philadelphia Phillies — JoJo Romero, LHP. Top prospect Sixto Sanchez is on the DL with elbow inflammation, but I’m not sure I’d trade him for Machado anyway. I’d try to land Machado with a package of prospects, starting with Romero, a fourth-round pick in 2016 who has seen his stuff tick up since drafted. He’s in Double-A with a 4.06 ERA, but 96 strikeouts in 99⅔ innings. Atlanta Braves — Kolby Allard, LHP. The Braves need bullpen help, but should also be in the mix for Machado. The team’s first-round pick in 2015, Allard is pitching well in Triple-A at age 20 with a 2.96 ERA. With a mediocre strikeout rate (79 in 97⅓ innings) and less-than-blazing fastball, his upside isn’t viewed as high as some other Atlanta pitching prospects. I’d consider dealing him as the centerpiece of a Machado trade or for a controllable reliever such as Brad Hand or Kyle Barraclough. Washington Nationals — Jefry Rodriguez, RHP. Realistically, the Nationals have to rely on the current roster to start playing better rather than making a splashy trade. After Monday’s loss to the Pirates, however, the Washington rotation is 4-18 since June 1 with a 6.17 ERA — worst in the majors. Rodriguez, who started Monday, has a nice arm but isn’t the answer right now. New York Mets — Jacob deGrom. Look, you obviously want to acquire guys like deGrom, not trade them away. On the other hand, it’s now back-to-back awful seasons for the Mets, the new wave of youngsters such as Amed Rosario and Dom Smith hasn’t impressed, and deGrom’s value is absolutely sky high right now. Would I trust the Mets to make the right deal here? No. Should they at least pursue one? Yes. The alternative, safer plan: Trade Asdrubal Cabrera and Jose Bautista. Miami Marlins — Kyle Barraclough, RHP. Again, with the lack of difference-making starting pitchers on the market, teams will be looking to load up bullpens rather than overpay for a No. 5 starter. Barraclough is one of those effectively wild relievers, with a walk rate that’s a little high, but he’s tough to hit (.121 average) with no platoon split. Because he’s under team control for three more seasons, the Marlins should be able to extract a nice price for him. Milwaukee Brewers — Corbin Burnes, RHP. When I suggested the Brewers go after deGrom, I was surprised Brewers fans were so resistant to the idea. I get not wanting to empty the farm system, but deGrom is an ace who is under team control through 2020. The Milwaukee rotation has surpassed all expectations with a 3.73 ERA, but the Brewers are 26th in the majors in quality starts (because they don’t go deep into games) and there’s no guarantee they’ll pitch to a 3.73 ERA in the second half. OK, getting deGrom is unlikely anyway. The Brewers also could use Machado, and that would probably mean parting ways with Burnes, the team’s top pitching prospect. Oh, he was just called up to pitch out of the bullpen. Sounds like a little bit of a showcase. Chicago Cubs — Thomas Hatch, RHP. The Cubs have hinted they won’t do much, and that makes sense. Their best chance to catch the Brewers lies with what they already have: Yu Darvish getting healthy and Kyle Hendricks and Jose Quintana pitching better. The offense leads the league in runs even though Anthony Rizzo and Kris Bryant have underperformed. If they make a deal, it will be a small one to add a bullpen arm. Hatch has a 3.83 ERA in Double-A and has a mid-90s fastball, but the walk and strikeout rates suggest he might be a future reliever. St. Louis Cardinals — Carson Kelly, C. Free Carson Kelly! Yadier Molina is signed through 2020 and currently sports the second-highest slugging percentage of his career. In other words, there’s no immediate opening for Kelly, who has proved he’s ready for a big league job. Pittsburgh Pirates — Corey Dickerson, OF. Dickerson has changed his approach this year — less power, fewer strikeouts — although the overall production is basically the same, just in a different way. He’s limited to a corner outfield spot but would be a nice bench bat/part-time starter for the Astros, Rockies, Indians, Diamondbacks or Mariners. Cincinnati Reds — Scooter Gennett, 2B. The Reds could trade Matt Harvey or David Hernandez, but those guys aren’t going to bring in an impact prospect. Gennett, just named to the All-Star team, would do that since he’s also controlled through 2019. The Dodgers need a second baseman and have a deep farm system, and prospect Nick Senzel could take over at second for the Reds in 2019. Los Angeles Dodgers — Keibert Ruiz or Will Smith, C. The Dodgers have a couple of interesting prospects sharing time at Double-A Tulsa in Ruiz and Smith (Ruiz has caught more, as Smith has also played third base). Smith is a college player out of Louisville, while Ruiz doesn’t turn 20 until next week, so while Smith has outhit Ruiz, you have to factor in the age and experience difference. I don’t know which one is the better prospect, but if the Dodgers know whom they prefer, maybe they should trade the other. Colorado Rockies — Carlos Gonzalez, OF. The Rockies are on that bubble, although only 3.5 games out of first place, which probably makes them moderate buyers, maybe for some bullpen help or a first baseman such as Lucas Duda. DJ LeMahieu and Adam Ottavino are both free agents, but the feeling is they won’t trade either guy, since talk out of Denver is they have to try to contend if they have any hope of keeping Nolan Arenado long term. Anyway, J.P. Morosi floated a Gonzalez-to-the-Astros rumor, and if they can deal CarGo for a decent prospect, they should do it. San Francisco Giants — Shaun Anderson, RHP. The Giants are in the same situation as the Rockies, and while it would be fascinating if they put Madison Bumgarner on the block, that’s not going to happen. In fact, they just traded Austin Jackson to clear off some salary room. The Giants got Anderson last July for Eduardo Nunez, and he’s having a solid season at Double-A. San Diego Padres — Kirby Yates, RHP. What, not Brad Hand? Sure, the Padres will listen to offers for the two-time All-Star, but since he has signed through 2021, the Padres also view him as part of the future they think will soon arrive. Yates, however, is clearly the kind of guy you should cash in, a 31-year-old journeyman who is having a career season with a 1.53 ERA and good peripherals.